What keeps coming to mind during my current Michel Houellebecq binge is that beneath the surface of his nihilism and despair is an un-extinguished faith in the redemptive potency of love and friendship, a hope that he realises is unfulfillable but impossible to abandon. This afternoon, feeling a little dour, I took a break from my Houellebecq bender to reread some of Kate Chopin’s The Awakening, which I read at Francis’ recommendation some years ago. Once again I came across a favourite paragraph, underlined in pencil, which she repeats at the start and end of her novel. The voice of the sea is seductive; never ceasing, whispering, clamoring, murmuring, inviting the soul to wander for a spell in abysses of solitude; to lose itself in mazes of inward contemplation. The voice of the sea speaks to the soul. The touch of the sea is sensuous, enfolding the body in its soft, close embrace. The sea, in both deadly and enriching form, is almost a character in The Awakening, and Chopin’s poetic description stands in relief to the sparseness of the rest of the text. The storyteller in me wishes I could point to one watershed event, but the truth is that we had change slowly, incrementally, coming closer together through thousands of tiny moments that make up a day, a life. This didn’t have to happen. I knew from experience, both my own and others, that those moments could have just as well pulled us apart, if even one of us had chosen otherwise. In other words, Staal participated in a relationship through the high and low points and grew. A memoir, engagingly told, not particularly profound, and one that fails to offer any substantive suggestions about how women (or men) can reconcile the broad ideals of feminism with marriage and parenthood. Plus ca change, plus c’est la meme chose. There is considerable value though in Reading Women is as a synoptic primer of feminism, at least as it pertains to the middle classes. Staal progresses chronologically through ‘Fem Texts’, with a fascinating summary of Elaine Pagel’s Adam, Eve, and the Serpent, an ‘intellectual history of the first two chapters of Genesis that traces traditional patterns of gender and sexuality’. From there Staal argues convincingly for the continued relevance of first-generation feminists like Mary Wollstonecraft, cleverly contrasts the fiction of Kate Chopin and Charlotte Perkins Gilman, and moves on to a half-hearted defence of Beauvoir. The strongest section of the book deals with the feminist writers most familiar to Staal, those of the sixties and seventies. The section I had been anticipating with interest was the next generation that includes writers like Hélène Cixous and Luce Irigaray. Staal evidently struggled with these texts and reverts to the comfort blanket of Erica Jong, amusing enough but trite. She recovers towards the end when studying Carol Gilligan’s In a Different Voice, the one text Staal covers that I felt compelled to order immediately. As a memoir it was a quick, occasionally amusing but ultimately forgettable event. As a whizz through three generations of feminist writers, for those, like me, that frequently know the names but only the basic arguments, it was a useful doorway to deeper exploration. 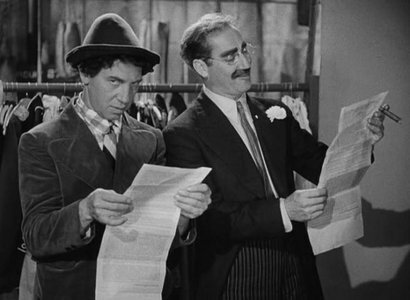 The first film that the Marx Brothers made for MGM, A Night at the Opera is on my list of top-5 films. The scene above never fails to brighten my mood. I am invoking the Sanity Clause on my participation in the Art of the Novella Reading Challenge. Thirteen books down, I am beyond Passionate. With the last novella, I reached my delight ceiling and this challenge began to feel less like fun and more like hard slog. For the rest of the month I’ll be cheerleading Frances in her continued attempt to read all 42 novellas in the series. Two of the thirteen I disliked, and two I thought first-rate. The others brought pleasure. There are some brilliant stories in the remaining twenty-nine novellas, which I look forward to reading at a more leisurely pace. For now, having digested thirteen new stories and many more memorable characters, I have binged on fiction. It is time for a little poetry, some diaries perhaps and non-fiction. With Kate Chopin’s The Awakening, my tenth book read as part of the Art of the Novella Reading Challenge, I pass Passionate level. Thus far, this tenth novella is my favourite. The story is of the growing self-awareness, and need for independence, of a New Orleans housewife, no longer able to suffer the confines of her conventional marriage or societal etiquette. It sometimes entered Mr. Pontellier’s mind to wonder if his wife were not growing a little unbalanced mentally. He could plainly see that she was not herself. That is, he could not see that she was becoming herself and daily casting aside that fictitious self which we assume like a garment with which to appear before the world. Edna, the story’s protagonist, casts aside her fictitious self, rejecting the proscribed model of wife and mother. In the end, this proves too challenging even for the man she loves. His departure catalyzes Edna’s inability to live independently in the society of her day. Emily wrote essays on The Awakening at school; Frances wrote: “You either already know or can imagine where Edna is headed, but if you have not already, you should read this.” I could not agree more.